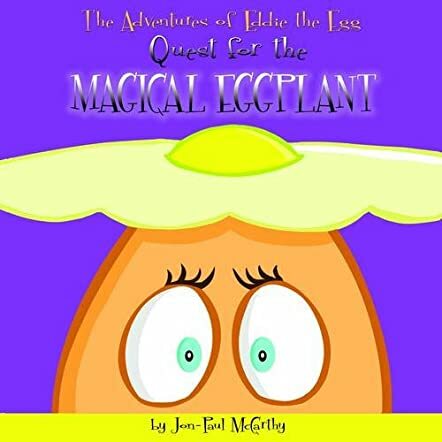 "Quest for the Magical Eggplant" is the second in a series of books by Jon-Paul McCarthy about 'The Adventures of Eddie the Egg'. This book reminded me of the old cartoons of the 1970’s that were written for kids but had hidden references that only adults would understand. There were many of those in this book such as the town of New Yolk City, the Suet Canal, the Gravy Train, and so on. Eddie wakes up to find that his friend Fried Frances had fallen off a wall and cracked her shell. He seeks help from Professor Sunnyside-Up who tells Eddie that he needs to find the Magical Eggplant because it has special healing powers. In order to get the Magical Eggplant, Eddie has to suit up in a special protective suit and fight the seven-headed sausage beast guarding the entrance to the cave that holds the Magical Eggplant. The illustrations are very colorful; although a couple of times they overwhelm the text, making it hard to read. I liked it when the illustrator included a side-view of Professor Sunnyside-Up’s head, which was a fried egg, of course. As with all children’s stories, this one has a happy ending that I won’t spoil for you (spoiled egg, get it?). At the end of the book, the author included a lesson on how to speak the special language of Leftover Land called Egglish, which kids will find fun to annoy their parents with.